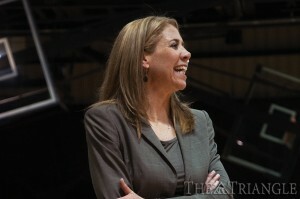 Head coach Denise Dillon will see an injection of youth on the floor this year. The Drexel women’s basketball team kicks off its new season with three freshmen who will be looking to make an impact on the team. Sarah Curran, Florence Ouattara and Alexis Smith will all make their debut for the Dragons this season. Throughout Denise Dillon’s tenure as head coach, she has never been afraid of putting young players in the game and throwing them into the fire. This has proven effective in the past, and she hopes her strategy will continue to be beneficial. Smith hails from Calvert High School in Prince Frederick, Md. At Calvert, Smith was very versatile, playing every position except center. From 2011 to 2013 she was on a state champion team at Calvert. She leaves Calvert as the school’s all-time leading scorer for both boys and girls. Smith was a four-time First Team All-SMAC, Washington Post All-Met Second Team three times and was First Team in her senior season. Ouattara is a 5-foot-11-inch combo guard from Life Center Academy in Burlington, N.J. Originally from Ivory Coast, Ouattara has been in the United States for a little over two years. At Life Center Academy she was part of a team that was ranked No. 3 in the county with a 28-3 record. Even with her limited basketball experience, Dillon said she views Ouattara as a contributing factor on the team. However, her contribution will be limited in the early stages of the season due to an injury. Following a long line of Dragons from Archbishop Carroll High School, Curran will join current players Rachel Pearson and Meghan Creighton as they help fill the void created by the departure of former Archbishop Carroll star Hollie Mershon. During her time at Archbishop Carroll, Curran played center, power forward and small forward. The versatility is a key reason why Curran will see a significant amount of playing time this season. As a junior, she was a member of the state championship team and was MVP of the Catholic League the same year. A First-Team All-State and All-Delaware County member, Curran knows she can be an integral member of the Dragons. “Whatever Coach [Dillon] needs me for, I want to do. If she wants me to box out, make a shot, whatever my team needs me to do,” Curran said about her role on the court this season. All three freshmen will have an opportunity not only to play but also to make a big impact for the Dragons this season. The loss of key starters from last year means that there are many open positions available. Whether or not any of the freshmen will be able to earn a starting position remains to be seen, but Dillon has brought in three talented players who will be the foundation of many Drexel teams to come.